Abonnieren Sie alle Meldungen von 5GAA - 5G Automotive Association e.V. During today's well attended keynote, 'Connecting the Mobility World with 5G', the 5G Automotive Association (5GAA) gathered experts from the automotive, technology and telecom industries to explain how the deployment of 'Cellular Vehicle-to-Everything' (C-V2X) communication technology on the path to 5G is shaping the mobility of the future. Today LTE-V2X, the initial version of C-V2X, stands on the verge of its commercial launch: allowing vehicles to communicate with each other and their surroundings and, together with 5G enhancements, facilitating broad scale improvements in road safety. "By bringing together key actors of the mobility ecosystem - across the automotive, information and communications technology industries - 5GAA continuously strives to develop forward-looking solutions for intelligent transportation services. Both for today and tomorrow." stressed Thierry Klein, 5GAA Vice Chair and Head of the Disruptive Innovation Program at Nokia Bell Labs. "These end-to-end integrated solutions bring enhanced safety, sustainability, and convenience to all road users. 5GAA is very excited to be pioneering the revolution towards a smarter and more connected mobility world," Thierry Klein added. A number of 5GAA members are announcing ground breaking use cases at this year' MWC. 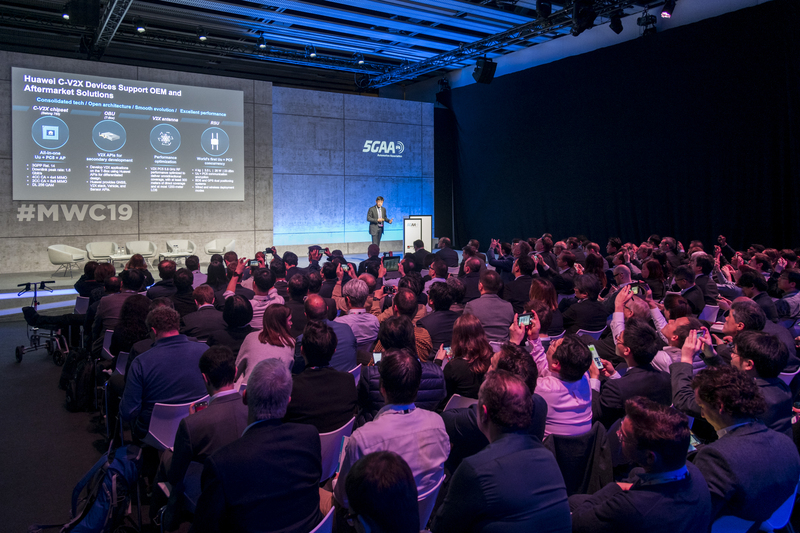 5GAA members Telefónica, Ericsson, Ficosa and Seat show 5G connected car use cases supported by C-V2X direct communication for safer driving in a city (e.g. detection of cyclists when turning right or of a pedestrian at a zebra crossing). Another key technology bringing these use cases to life is edge computing. In addition, 5GAA members Continental and Vodafone are working together to increase road safety and protect all road users for instance via "digital safety-shield" for cyclists and pedestrians, using C-V2X direct communication and edge computing in the first 5G deployments. The 5G-ready tests are taking place under real-life conditions at Vodafone's 5G Mobility Lab in Aldenhoven, Germany. Rohde & Schwarz has announced a collaboration with automotive electronics specialist Vector on a C-V2X end-to-end application layer test solution to verify safety-critical V2X scenarios. The companies' integrated test platform is showcased for the first time at Mobile World Congress. Deutsche Telekom has announced first C-V2X tests together with Skoda Auto in Czech as part of the European C-Roads project. Geely also announced its plans to launch the first mass-produced C-V2X enabled vehicles in China together with Qualcomm in 2021. Qualcomm has also announced its first 5G automotive platform, enabling both C-V2X short and long-range modes, which is expected to sample later this year and are planned for production vehicles in 2021. Mass production of C-V2X chips including direct communication from several suppliers is ongoing, and multiple radio vendors have already integrated these chips into their automotive radio offerings. 2019 is the year when C-V2X direct communication technology will be commercially available across the globe. Furthermore, full interoperability testing on C-V2X applications is ongoing among 5GAA members. The first mass-deployment in vehicles on the roads is anticipated to start in China in 2020; to be followed swiftly in other regions when local regulations allow for it. "C-V2X is now ready to roll. At Ford, we will begin to deploy this technology in all new models launching in the US starting in 2022" confirmed Don Butler, Executive Director of Connected Vehicle & Services at Ford Motor Co.
C-V2X provides a clear evolution path to the family of 5G technologies for both direct and network communication. Part of this evolution is the 5G New Radio (NR). NR-V2X will eventually ensure safe operation of autonomous driving vehicles by using 5G New Radio with Ultra Reliable Low Latency Communications (URLLC) network based communication combined with improved direct short range communications. "The development of the NR-V2X standard is due for completion by the end of 2019; eventually hitting the road in 2023. This will enable a new generation of use cases for connected automated vehicles", said Maxime Flament, CTO at 5GAA. For more information, visit 5GAA's website (http://http://5gaa.org/), LinkedIn (https://www.linkedin.com/company/5gaa) and Twitter (https://twitter.com/5gaa_official) pages.